We stayed in a room on the bottom floor of the inn. It seemed ideal for getting a quick romantic weekend in before all of the Holiday rush. I do have to say, I loved the accommodations. Though the room itself is rather small, the bed was THE MOST COMFORTABLE bed I've ever had the pleasure of sleeping in. You'd be surprised, as the room was right next to their Tini Martini Bar; but there was no noise from the porch area. Well, okay, so we'd occasionally have that oneeeeeee inebriated person who laughed just a "bit" too loud..... HAHA! I am thinking the most wonderful part of our stay was the room being permiated, upon waking in the morning, by the scents of breakfast cooking and coffee brewing. It made it feel like home, only we didn't have to do these things for ourselves! The brunches there were quite basic, when we stayed; but I have recently seen that they now offer a 2-course gourmet breakfast. Seating is all around the veranda, and you can't beat the view of the Matanzas Bay in the morning! Guests are also treated to a complimentary $15.00 which can be used toward a bar tab. 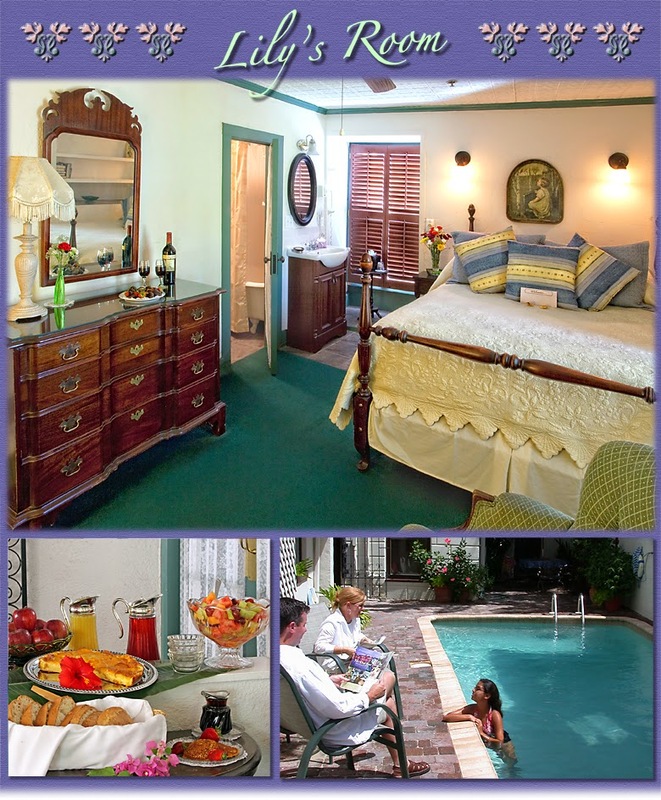 Upon returning to our room, we would settle down and relax with a drink every evening! It was great for some much needed time together. 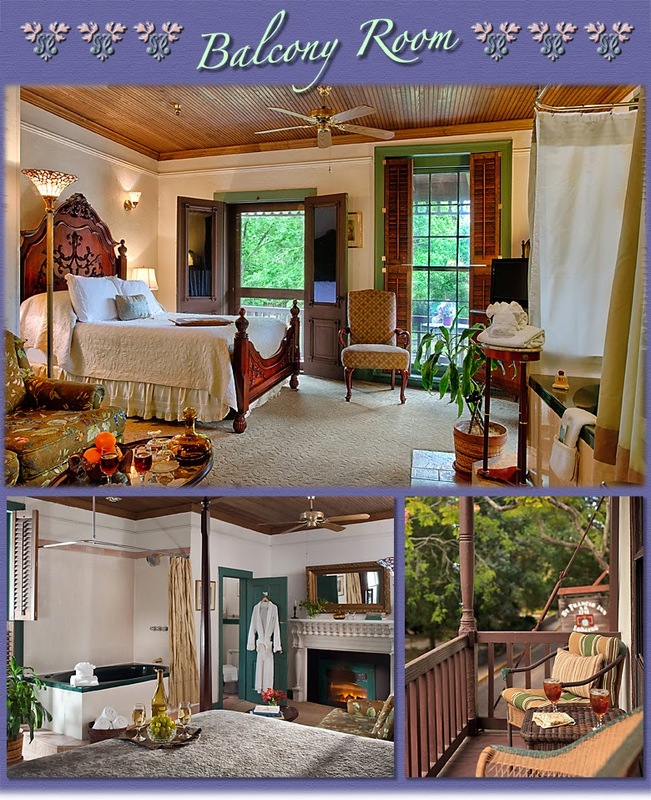 For you Ghost Hunters out there, the Casablana Inn also has its own tale of spirits! Don't forget to check out this link about the Widow and the Rumrunners! As for today's subject, I am thinking we should discuss that ghost story I'd promised last week????? Yeah, sounds great! So, here goes nothing.............. I will just borrow the story from the site for the St. Francis Inn.... I believe they will tell it best in their OWN words. 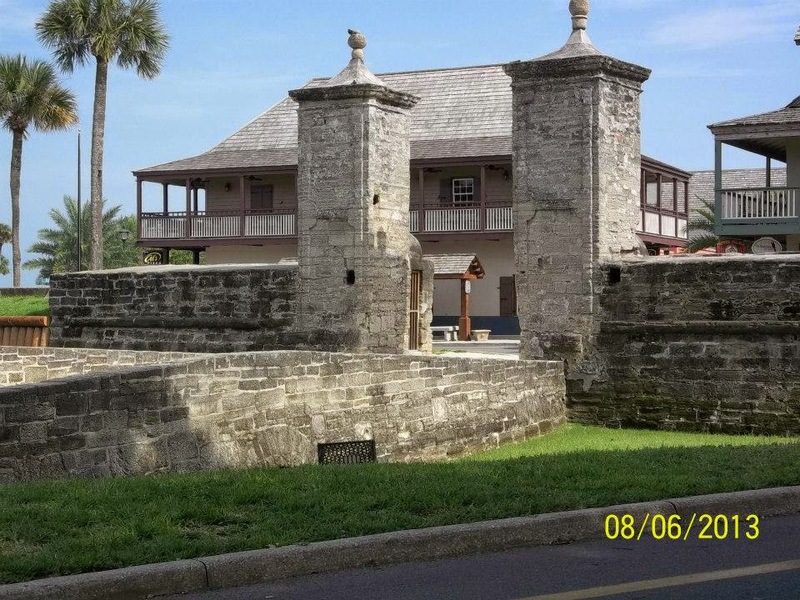 "St. Augustine, being America’s oldest city, has a colorful history of four centuries and many legends of ghostly figures. 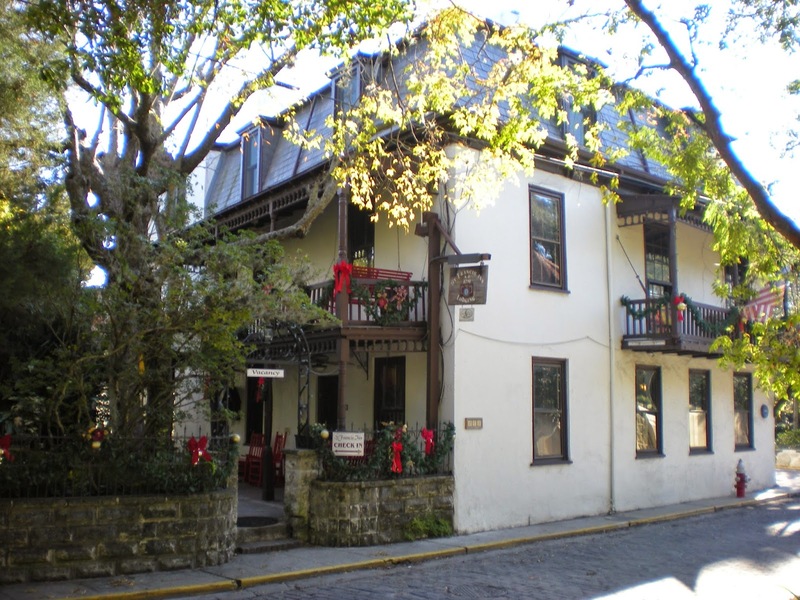 Some believe that the ghost of a young house servant haunts St. Francis Inn. She has become know as “Lily” and strange happenings reported in one third floor Inn room lead to it being named “Lily’s Room”. A story is told of a young man who lived with his uncle, Major William Hardee, who owned the Inn during the middle of the 19th century. He fell in love with “Lily,” one of the young black servant girls, believed to have been a beautiful slave woman from Barbados, and they would sneak into rooms of the inn to carry on their secret love affair. When the uncle, a military officer, walked in on the lovers, he dismissed the servant and ordered his nephew to never see her again. The nephew, deeply depressed, killed himself, some say by hanging himself in the attic, now Lily’s Room, others say by jumping from the third floor window. Interesting phenomena have been reported by guests about Lily and her soldier lover. A woman staying in Lily’s Room was awakened by a loud noise and woke to find the contents of her pocketbook scattered across the floor. Nothing was missing and she said the thud was too loud to have been merely the sound of the purse falling. A guest found her cosmetic bag full of water, while another found her makeup bag under an open window had stayed completely dry while the driving rain had soaked everything around it. A male guest found himself under the bed when he woke in the morning, and had to get help to free himself. In another occurrence, a new bride was awakened by a passionate kiss, then surprised to find her husband was sleeping soundly beside her. Other reports include sightings of a hand on the railing of the back stairs, a ghosted figure dressed in white passing in the halls, split second sightings of spirits, frequent sounds of whispering and moans, lights and coffee makers going on and off unassisted, radio stations being changed as witnesses watched, locked doors found open, shower water which comes out hotter and hotter no matter how much cold is added, falling books, moving pictures, icy cold touch, covers being removed, and female and male apparitions. Some psychics who have been to the Inn conclude that Lily and her lover have not been united in the afterlife within the Inn they haunt. Was it the resident ghost who caused a disturbing evening for another guest? He and his wife were staying at the Inn, but in a room other than Lily’s Room. His wife fell asleep quickly, but he had trouble. A strange sensation overcame him suddenly, which he said felt like someone was entering his consciousness, without seeming either good or evil. He left the room to see if a short walk would help, then returned to bed only to have the same feeling, and he attempted to allow it to become stronger. After what he thought was a long time, he shook off the feeling and went for another walk and some coffee, finally returning and able to fall asleep. Fortunately, the recalled paranormal events at St. Francis Inn have been described as friendly, though sometimes mischievous, but not harmful. Many describe their apparitions as being pleasant, not disturbing. 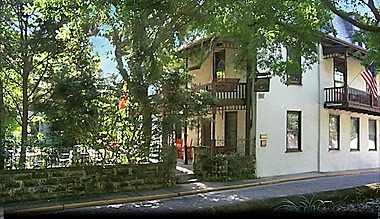 Many guests are attracted by the possibility of a ghostly encounter. 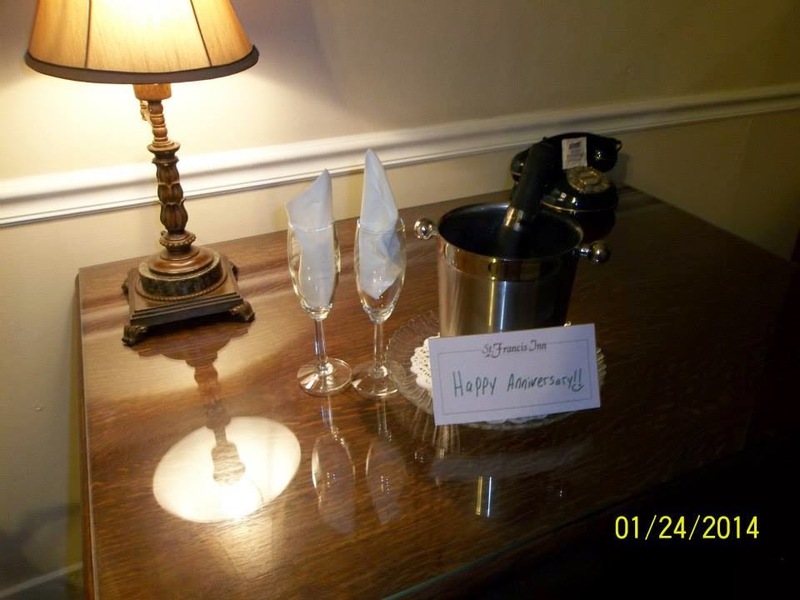 On your visit to St. Francis Inn, please let the innkeepers know if you have a paranormal experience." he had closed were opened up again!!!!!!!!!!!! Have any of you had your own Ghostly Experiences???? Let me know and post below! What To Do.... What To Do......????? A picture I took of the old City Gates..... Yeah, it's my favorite because it means I am almost to Kilwin's! HA! The Nation's oldest city (est. 1565) features history on every street corner, plus fine dining, unique shopping, award-winning inns, historic hotels and authentic Old World ambiance. A part of the Spanish Empire for longer than it has been part of the United States, the city's ancient architecture, narrow streets and beautiful bayfront made it Travel+Leisure's first choice as a place where Americans can feel like they are in Europe without leavnig their homeland. The city features the nation's first National Monument along with 32 buildings and 144-square blocks on the National Register of Historic Places. A full schedule of historical and cultural events, many featuring authentic re-eanactors, provide an entertaining and informative look at the city's nearly 450 years of history. 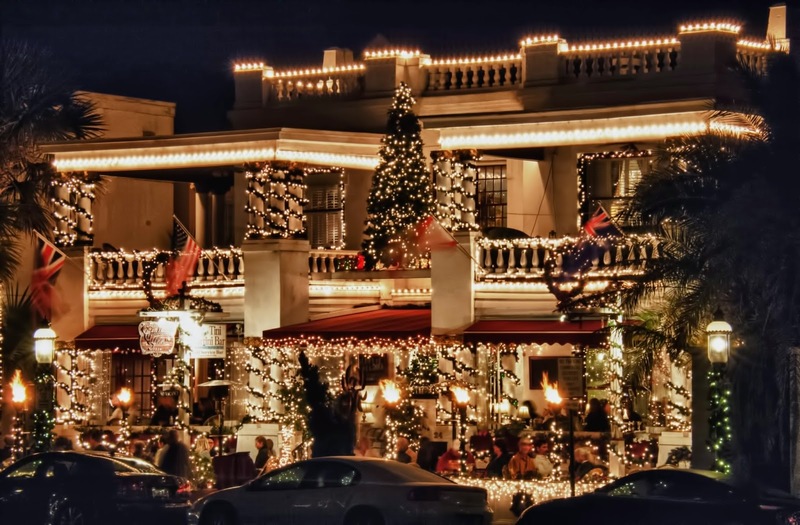 Attractions such as the St. Augustine Lighthouse, Spanish Colonial Quarter, St. Augustine Alligator Farm Zoolocial Park, Ponce de Leon's Fountain of Youth and the World Golf Hall of Fame are popular with the entire faimily. Plus, the city is a popular wedding destination and an ideal and memorable location for romantic getaways. This coastal community north of St. Augustine is known for both world-class golf and internationally-acclaimed spas. Its luxury resorts offer stunning beaches, a host of recreational activities, fine dining and shopping. Here you can ride horseback along the beach or hike miles of nature trails. The location of the PGA Tour Headquarters, it is the home of THE PLAYERS Championship featuring golf's greatest players and biggest purse. The AAA 5-Diamond rated Ponte Vedra Inn and Club, the Sawgrass Marriott Golf and Spa Resort and the Ponte Vedra Inn and Club set the standard for seaside luxury and pampering. From Ponte Vedra in the north to Marineland in the south, Florida's Historic Coast features 42 miles of inviting Atlantic beaches perfect for year 'round getaways. Although linked by beautiful sand and surf, the communities of Vilano Beach, St. Augustine Beach, Butler Beach and Crescent Beach each have unique charms that create ideal seaside vacations. Anastasia State Park with miles of remote beach make it popular for those who truly want to get away from everything but the sea. Throughout Florida's Historic Coast, a 35-foot height limitation on buildings insures beach panoramas are never marred by towering condos, hotels or office buildings." A Couple Cool, Little Shops To Drop By! I know, it is Friday.... And WHAT does "It's Friday" mean???? It means, NO, WE DON'T WANT TO READ YOUR BLOG TODAY BECAUSE WE'RE GOING TO HAVE FUN! Yeah.... right.... I know how it is! LOL.... But, if you could, please take a peek at these two amazing little shops I discovered (yes, after all this time) in the heart of Colonial Town Saint Augustine, Florida!!!! 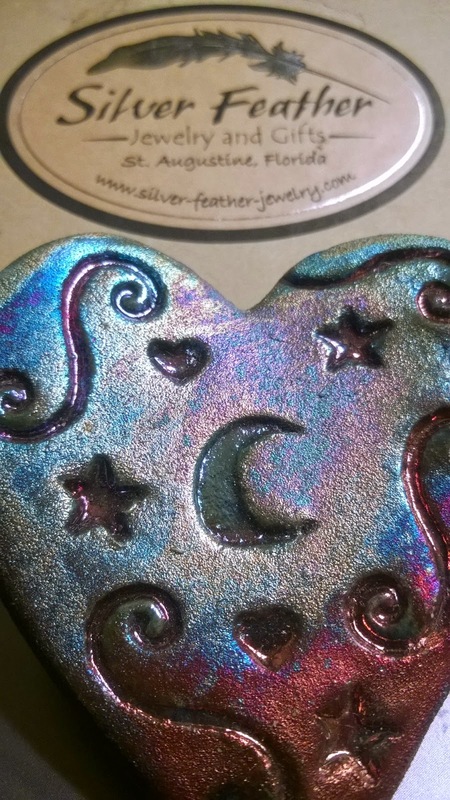 Pictured above is a neat place called "Silver Feather Jewelry and Gifts".... I know, I've waltzed by it a million and one times, thinking to myself, "Yeah, yeah... more stuff and trinkets... blahblahblah..." But no! It is NOT like that at all! What they carry are some truly unique items, and well worth your perusal!!!!!!!!!! I found that heart-shaped item in their store, and vowed I would no longer live without it's iridescent beauty! I do not often purchase impulsively, but I could not resist the draw.... I looked about the store while my hubby was paying for my heart, and I found I could have purchased so many more items, that we'd never recover and have to open a new credit card to cover all the monies I was about to spend!!!!!!!! They had earrings and necklaces, bracelets and rings. There were hand-made items, as well as geods and other rocks and crystals. They had rather cool-looking little trays that were made of polished geods that had been made in an almost flat design (don't know how else to describe them)...... But, suffice to say, I would love to have one of everything! Oh, and they had more shapes than just my heart up there! Truth be told, there was a shop in front of the boutique. You have to wade through tiny isles nestled between Mexican/Spanish-looking pottery (they have frogs too, which I had a hard time resisting!) to find Gyspy Moon, kind of just FYI! Anyway, I kept sniffing and sniffing, and finally found this little tiny shop, almost hidden in the back-right area of the buildings......... I saw it, sniffed it, and fell in love with it! It was at that moment I was determined to smell every single bar of soap they had available for purchase! I even considered living there, from now on, for the rest of my days.... Well, the floor looked rather hard, and I am sure the owners wouldn't appreciate me after I hadn't bathed in a week... But, what did I have to lose, right? So, once I came to my senses, I realized they had the most unique combinations I'd ever seen.... 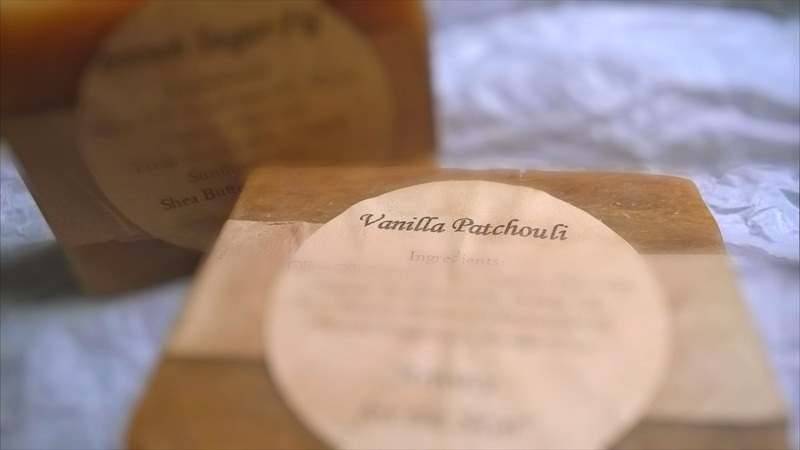 Above is pictured their Vanilla Patchouli soap, along with Brown Sugar Fig. Presently, I am loving the Honeysuckle Aloe I purchased that same day. My husband even bought himself a bar. It was called Yo Ho Ho Bay Rum, and yes, it smells masculine and like a pirate, only clean! HAHA! My son insisted on buying Dragon's Blood soap. I tell you, the owner truly knows her scents, and isn't afraid to use them!!!!! The soaps are prices resonably, and (as I've found out for myself) have a very long life for your bathing pleasure.... Not to mention, they make the whole room smell incredible!!!!!!!!!!! Okay, my fellow St. Augustine Lovers. How many of you love pizza???? Yes, yes, we do too! 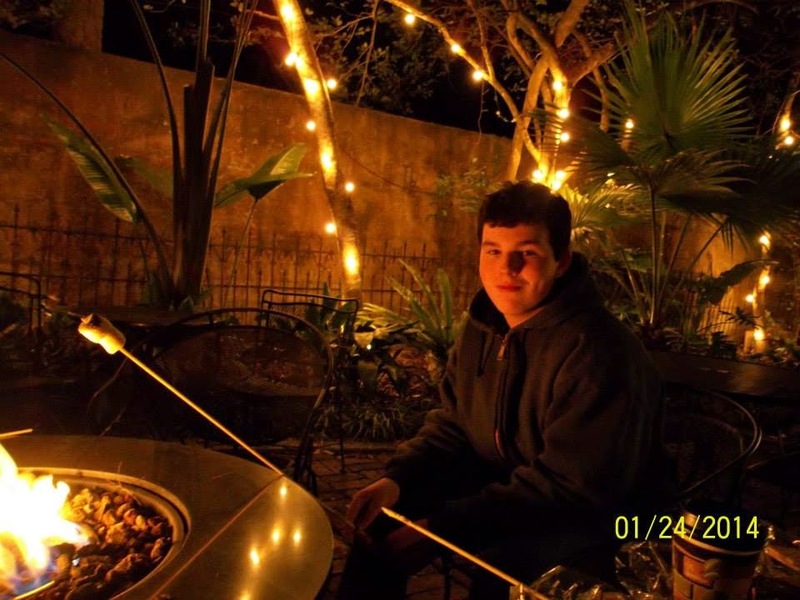 I'd raise my hand, but then I couldn't type up this wonderful blog; and you would miss out on the BEST pizza restaurant in Old City Saint Augustine! 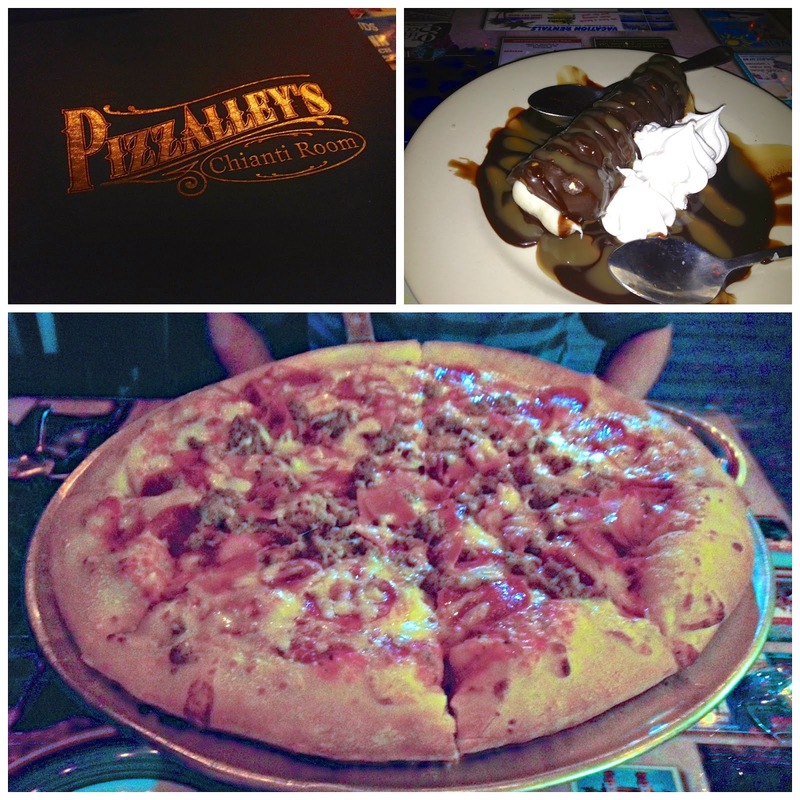 Above are pictures of Pizzalley's Award Winning Pizzeria! 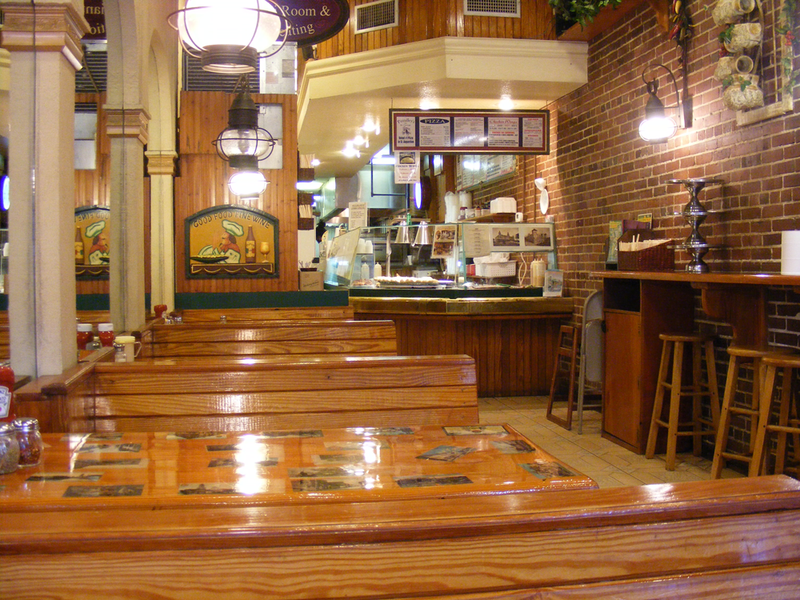 The front of the restaurant, facing Saint George Street, is casual carry-out or dine-in. 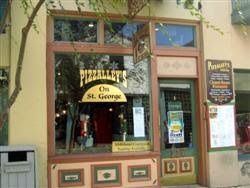 They usually have someone out front of the door, calling to all of us starving tourists, to come over and try a sample of their delectable pizza.... We usually enjoy buying a slice of pizza a piece, some cheese sticks, and an order of their amazing bread sticks! It is best for a quick bite, and the soda machine is available for free refills! 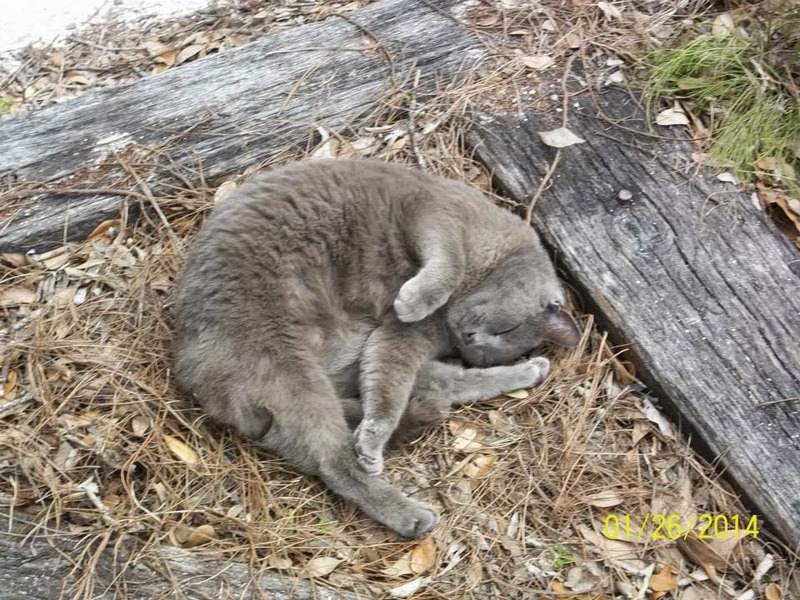 (Which is very important during Summer here in the Sunshine State!)........ 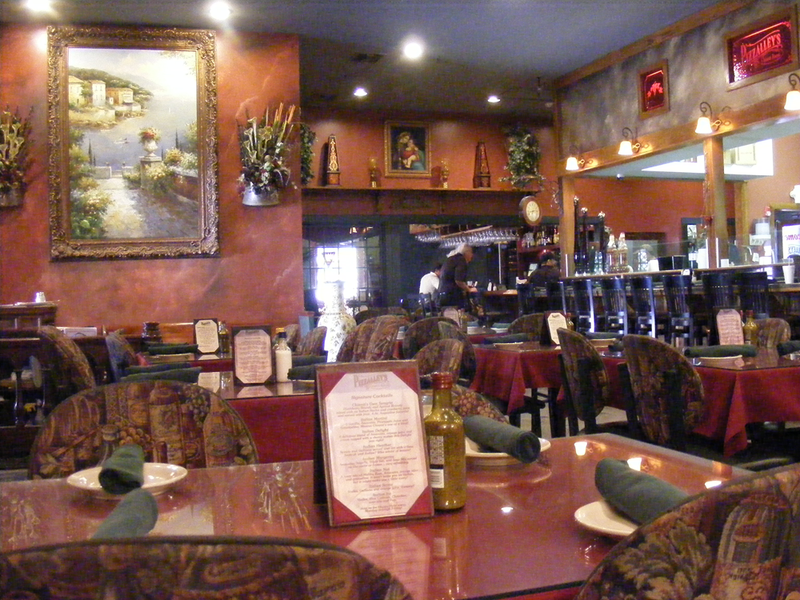 If you walk back through a hallway, past some outside seating area, and into their other restaurant; you will find a completely different ambiance. Pizzalley's Chianti Room takes you away from the hustle and bustle of the town to a quiet, more upscale restaurant for a relaxing dinner. You can choose between indoor or outdoor seating. Outdoor usually offers live entertainment during dinner. The inside seating also has a full-service bar running the length of the room. 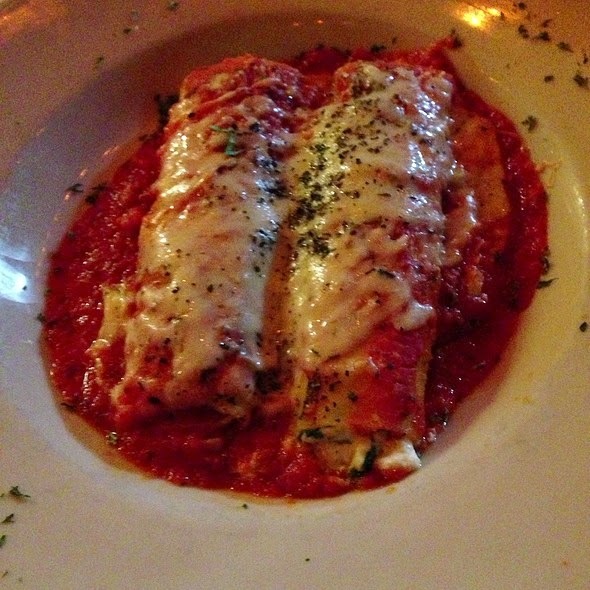 It is beautiful and romantic, either way; and the food is simply exquisite! P.S. If you decide to order a pizza from the casual side, make SURE your hotel reservations include a refrigerator for leftovers - you'll DEFINITELY have them! 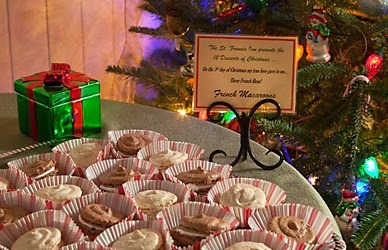 We will start by giving you the link to their page, http://stfrancisinn.com/ . Heehee, now we get to the GOOD part of the inn.... the BEST part of the inn, in my opinion... THE FOOD!!!!!!!YAYAYAYA!!!!! Can we get a "WOOT!" and an "AMEN!".... 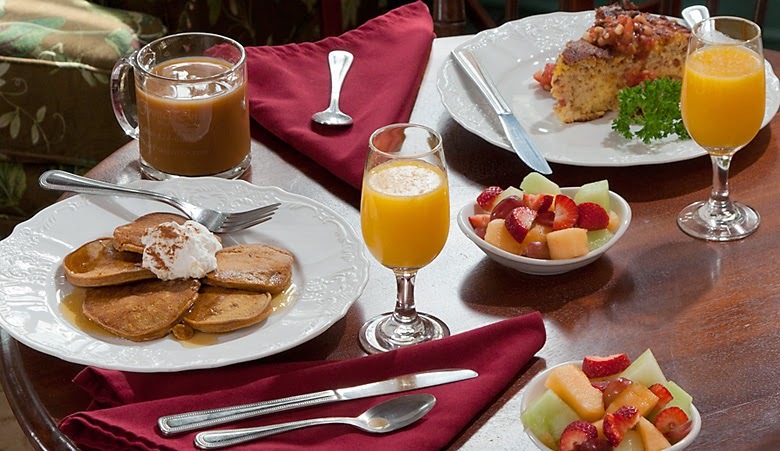 Yes, the one thing that truly sets this inn apart from others in Saint Augustine (mind you, I've researched various B&Bs, and the food does not seem to meet the standard set by the Saint Francis) is the amazing breakfasts! Here is a picture I took of our Anniversary Surprise! and the crusts are flaky goodness! Yes, yes... 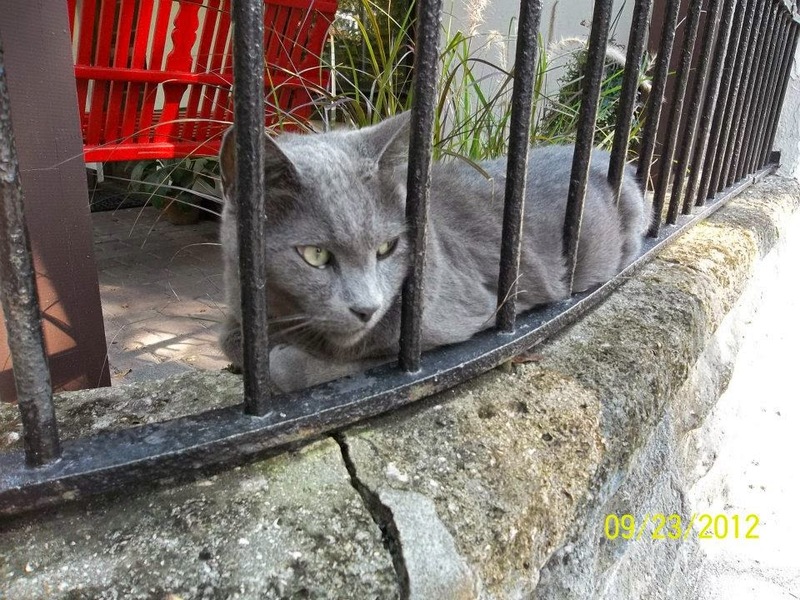 It would seem I was unable to locate appropriate pictures of the Brunch Selection at the Saint Francis Inn; so I was forced to rob them of their own pictures from their site.... I hope that is okay with them..... If not, I've never seen these pictures before and someone MUST have hacked my blog! 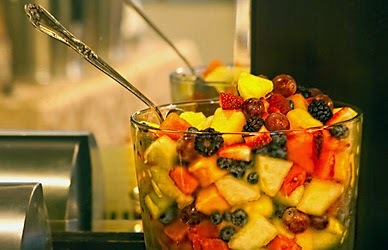 Every morning, fresh fruit salad or fruit soup is offered, along with an assortment of fresh baked goods. Homemade granola and assorted cereal is available for those who prefer a lighter breakfast. Beverages include coffee and assorted teas, fresh juices, and whole and skim milks. 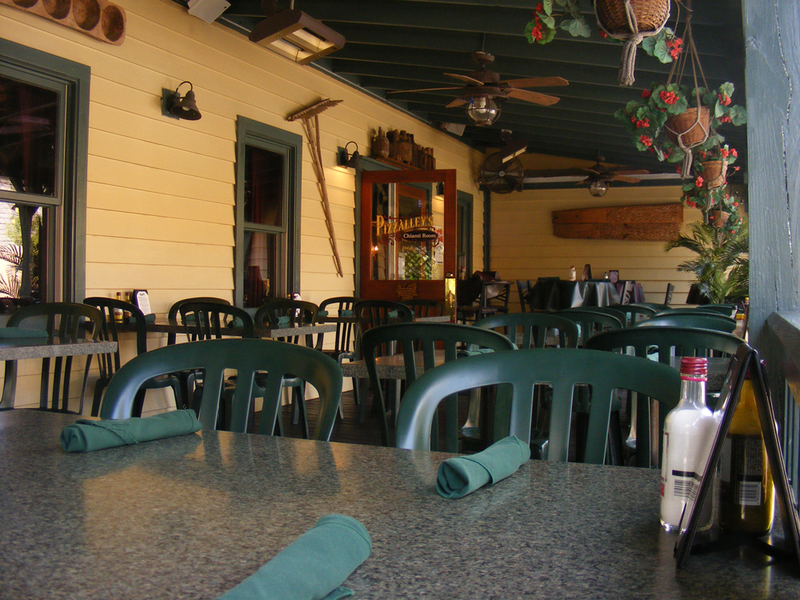 Hot entrees include Stratas, Cheesy Eggs, Pumpkin Pancakes, Fresh-baked Biscuits and home made Sausage Gravy...... I have to take some time here to compliment the amazing biscuits! I usually plan my vacation so that I am there the mornings they offer Cheesy Eggs, Sausage Links, and the above-mentioned Biscuits with Sausage Gravy..... I could eat it every morning! LOL... The French Toast Bake is to die for! Subtle flavors do not overtake the delicious bread, which is difficult to find in a French Toast. Remember to try their fresh-bakes mulitgrain bread! Once again, another staple I could live off of! Their daily breakfasts differ from morning to morning.... Breakfast is served Monday through Friday from 7:30 to 9:30am. On Saturdays, Sundays,(and post Holiday mornings), Brunch is served until 10:30, and include complimentary Champagne Mimosas and Bloody Mary's which you can prepare for yourself, to taste! My son, toasting his marshmallow for his S'Mores! S'More roasting is available on those chilly nights only! the most DELICIOUS home-made desserts I've found anywhere! 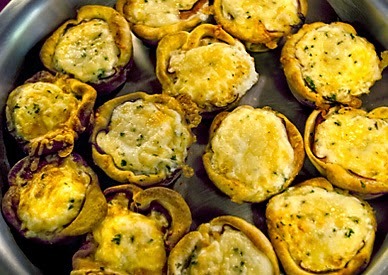 And, as if these were not ENOUGH incentive to stay at the St. Francis Inn, they also offer a Happy Hour! :D TAH-DAHHHHHHHHHH! From 5:00pm to 6:00pm, they offer up an "Evening Social Hour". Everyone from the inn usually comed in from their explorations to partake of delicious foods and beverages.... As with their Breakfasts and Desserts, their appetizer offerings change daily. Some examples would be Antipasto Tray with homemade Crostini, Zesty Homemade Hummus with House Baked Pita Chips, Crab Dip, Taco Dip, and the Meatballs are amazing! For your convenience, they serve local wines from San Sebastian Winery as well as House Wines from Corbett Canyon, and bottled Michelob Beer. Other wines, beers, mixed drinks, and their Signature "St. Francis Sunset" Cocktail are also available for purchase. Zeke says, "COME VISIT ME SOON!" Heading to Saint Augustine for the day!!!! YAY!!!! How many of you will be there too????? Happy Saturday, Everyone!!!!!!!!!!!! Sweets to the Sweet..... MWAHAHAHA! Did Someone Say Saint Augustine????? ?